Years ago, P.C. Sacchi Chevrolet-Buick in Arcata, Calif., sold and serviced vehicles. Today, the former dealership is home to a marijuana grow house and dispensary. ARCATA, Calif. -- Looking from outside the papered-over roll-up service bay doors of the defunct Isaacson Ford dealership here, one might assume the building was abandoned or had been turned into a body shop paint booth. But what is happening inside is something far different. Once so lovely a showroom that it hosted a Ford commercial, the former Isaacson Ford is now home to two marijuana grow houses, a pot dispensary and a hydroponics equipment store. Around the corner, at the former P.C. Sacchi Chevrolet-Buick dealership, the service department has been turned into another medical marijuana grow house and dispensary. And the operations are legal in California, although the feds have other ideas. With the car industry in the weeds, the refrain of defunct dealers is that they have gotten out of the car business and into the commercial real estate business. The hard part is that a building the size and shape of a car dealership, sitting on a big piece of property, can be hard to sell. California is among 15 states -- including Michigan and New Jersey -- that have passed legislation allowing the growth and possession of marijuana for medicinal purposes. And after sitting vacant for several years in the late 1990s, the Arcata car dealerships have been transformed into growing businesses. If one drives north from San Francisco for five hours, the last 100 or so miles of remote, twisting coastal mountain roads provide little company but acres of towering redwoods and the surging Eel River. Then, the road plunges west, toward the shore and the active earthquake zone of Humboldt County. This part of California is known as the Lost Coast. Arcata and neighboring Eureka are the only major towns of note, spawned during the timber and gold rushes of the 19th century. Arcata has developed a reputation as a cannabis-friendly zone, with four marijuana dispensaries. The biggest dispensaries, and the only ones that grow their own marijuana, are in the former car dealerships. Why Arcata's Ford and Chevy dealers went bust is the same old story. Highway 101 expanded and bypassed downtown Arcata, and competing dealerships in neighboring Eureka capitalized. 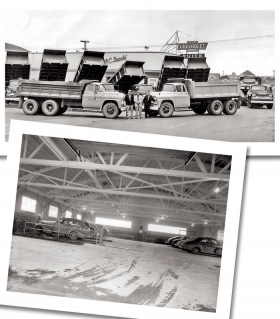 When times got hard, the Sacchi family sold its business to the Chevrolet dealer up the road in McKinleyville, while Isaacson Ford simply folded. Now Harper Motors, a strip of dealerships between Eureka and Arcata, is the only game in town. But because Arcata is an environmental hot spot, "we've never torn down a building," says Patti Stammer, vice president of the Arcata Chamber of Commerce. That has led to some flexible thinking for what to do with the space occupied by the two former dealerships. They sat decrepit for a number of years before local real estate developer Danco and a private partnership of investors bought the parcels to try to sublet them. Tenants have come and gone, but the most stable ones have been involved in the marijuana trade. Danco officials declined to be interviewed. A spokeswoman said that Danco is "merely the landlord." Alex Stillman, an Arcata city councilwoman and former mayor, says the dealerships used to bring in $60,000 a year in city sales taxes. She is unsure whether the pot dispensaries and other businesses can equal that, although Arcata recently raised its sales tax rate to provide for better roads and more police. "Most downtowns have a white elephant. ... These dealerships sat empty for years," Stillman says. "It has been hard to make up the difference in tax revenue they generated. But as long as the dispensaries are within ordinances, they are OK."
And that's the rub because even though licensed dispensaries are within the confines of California's Proposition 215, which spells out the state's rules for possession and cultivation of marijuana, federal officials, including those with the Drug Enforcement Agency are keeping watch. 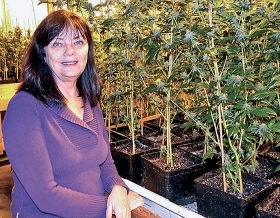 Mariellen Jurkovich, proprietor of the Humboldt Patient Research Center, which is in the site of the former Isaacson Ford, said federal agencies have pressured three banks to shut down her dispensary's bank accounts. "The scary part about it for the people who own the building is that the federal government can say this is illegal -- even with Prop. 215 -- and seize the building," she said. Mariellen Jurkovich runs the Humboldt Patient Research Center at the site of the former Isaacson Ford store in Arcata, Calif. Although Jurkovich's dispensary appears a bit bedraggled, it is high-tech. Every eighth-ounce bag of marijuana is bar-coded. The dispensary has a nutritionist and clinical sociologist on staff, as well as an MBA on retainer to help with point-of-sale merchandising. Jurkovich wants to unite with doctors and labs to create cannabis-based medicines, which she feels is a more organic way to treat illness than with chemical pharmaceuticals. "That's not where the money is," she laments. "But I have patients who want medicine, not to get high." Nearby in the former P.C. Sacchi dealership, Humboldt Medical Supply only employs ill people who are in medical need of its product. Having just received its grow permit, HMS has converted the parts and service area into several marijuana grow and cloning rooms. Linda Anne Cummings, HMS controller, said the renovation of the dealership cost $120,000. But with the ability to grow 20 pounds of marijuana every six weeks, that's a lucrative cash crop at $350 an ounce. And that doesn't count the remnants that get converted into lozenges, brownies and suppositories for those who can't smoke. Said Cummings: "The city wanted us downtown to keep an eye on us." Not that it's all about pot. Along with a Mexican cantina, surf-skate-smoothie shop Greenhouse Boards also occupies part of the main Sacchi showroom. Grass-roots media outlet Internews is headquartered in the back shop area. City backers point out that Arcata is host to the corporate headquarters of Kokatat watersports wear, boasts the FoxFarm Soil & Fertilizer Co., and was the fountainhead for Yakima roof racks. And Humboldt State University, part of the California State University system, has one of the country's top-ranked botany and forestry-management departments. But Kevin Hoover, editor of the Arcata Eye newspaper, believes pot could be Arcata's best brand. "It's here. It's an asset. It's not going away," he said. "It's not just hippies that smoke pot. It's regular people. Why not make it an advantage? We could be what Napa Valley is to wine." For now, it's the marijuana trade that keeps Arcata in the news. And if stacks of $100 bills help keep the local economy going, well, city hall has been known to turn a blind eye. Said Stammer: "It's kind of like the end of Prohibition."